Tucker International, LLC is a private management consulting firm whose founder and President is certified by the Institute of Management Consultants, USA and a Trustee to the International Council of Management Consulting Institutes. Founded in 1994, Tucker delivers proprietary intercultural assessment, coaching and training programs for global organizations. Late 1960’s/early 1970’s – Consulting with the American Peace Corps, designing and training programs for American Peace Corps Volunteers for service in Iran, Afghanistan, Central America and Brazil. 1973 – Field research in Brazil. 1973-1978 – Large scale field research for the US Navy. Creation of the Navy Overseas Assignment Inventory (NOAI). 1978-1982 – Assessment and Training for large numbers of employees and families assigned to Venezuela for Reynolds Aluminum. 1982 – Founding of Moran, Stahl, and Boyer International Division. Mid 1980’s – MS&B International achieves a clientele that features 8 of the top 10 Fortune 500 companies. 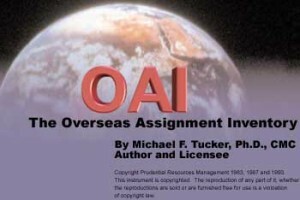 Creation of the Overseas Assignment Inventory (OAI). 1994 – Founding of Tucker International. 1996 – Pilot Program for NASA International Project Management (program presented bi-annually for 18 years). Late 1990’s – Assessment and Training for large numbers of employees and families assigned to South Africa for SBC; to Indonesia, Africa and Peru for Newmont and to Japan for the Walt Disney Company. 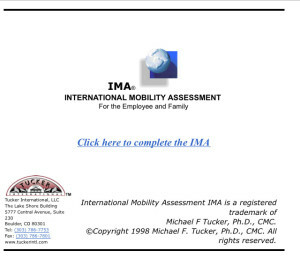 1998 – creation of the IMA® International Mobility Assessment. 1999 – creation of the Expatriate Evaluation and Development Guide SA and standard, the EED Evaluation of Expatriate Development, SEED Supervisory Evaluation of Expatriate Development. 1999 – Pilot for KPMG International Mobility Program (program continues to this day). 2002 – Won a competitive bid for the Assessment of some 2600 CEMEX managers for global assignments. 2004 – Won a competitive bid for the design, development and delivery of Intercultural and English Language Training for large numbers of AOL Indian call center employees in Bangalore which led to the creation of ACE (Achieving Customer Excellence) American Culture and English Language Training Program. 2006 – Won a competitive bid for Assessments in 16 countries for General Motors employees being considered for international assignments. Created ExpaTracks ℠, a secure international data access, retention and tracking system. 2007 – creation of the Survey of Expatriate Training and Development (SETD) ℠. 2009 – The TAP® Tucker Assessment Profile was launched. 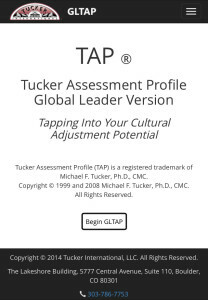 2011 – The Global Leader TAP® Tucker Assessment Profile (GLTAP) and the Global Business Experience (GBE) were created. A major study on the intercultural competencies of global leaders was conducted using these two assessments (partnering with Right Management). 2014 – Expatriate TAP assessments reaches 1800. GLTAP assessments completed for all senior level executives of a global Fortune 100 company.